Notre Dame’s Isabel Cassidy led the Titans with a team high 11 first half points in their home contest on Monday against Valley. PORTSMOUTH – Just as things were looking slightly murky for the Notre Dame Titans on Monday, they took their game to another level. In the latter stages of the first quarter, the Titans trailed on their home court to Valley 11-7 as they struggled to limit the Indians points. Yet when they flipped their switch, it was all Valley could do to stop the train barreling towards them. After trailing by four, Notre Dame proceeded to go on a 13-0 run to close out the first quarter, taking a 20-11 lead into the second. But they wouldn’t stop there. If you’re allowed to count runs over the span of various quarters, which we will for the sake of this argument, Notre Dame went on to outscore Valley 43-9 from the moment they trailed 11-7 in the late stages of the first quarter all the way to the end of the third quarter in an incredible display of defense. Maybe the story of the game, besides the insane run the Titans went on, was how well Isabel Cassidy played. The sophomore came out firing in the first half, scoring a game high 11 first half points off three threes and a made two. Thanks to a basket made in the fourth, Cassidy finished her night with 13 points while guard Taylor Schmidt recovers from an injury suffered on Saturday. Katie Dettwiller finished with a game high fourteen points, almost quietly. The senior center that has already signed her letter of intent to play at division one college basketball at Saint Francis University has a major impact on every single play, even if sometimes it feels like her numbers go overlooked. With just seven games left in their regular season and still boasting an undefeated 15-0 record, Notre Dame is still trying to take their season one game at a time, while maybe discussing a potential tournament run here and there. 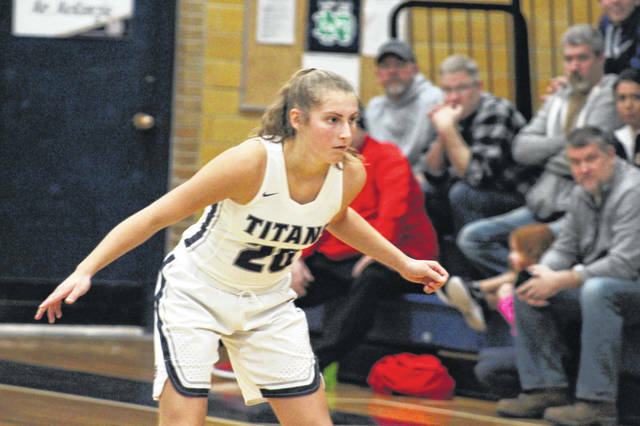 https://www.portsmouth-dailytimes.com/wp-content/uploads/sites/28/2019/01/web1_IMG_7912.jpgNotre Dame’s Isabel Cassidy led the Titans with a team high 11 first half points in their home contest on Monday against Valley.